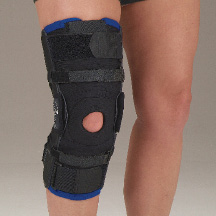 This is my favor brace. It is just perfect for busy sports mom . It 's very comfortable and secure my leg. I have to wear a brace pretty much whenever I'll be on my feet for more than a couple of hours. Since it's not neoprene, this brace breaths and doesn't bother my skin at all. The adjustability is great, and the price is right. The sleeve or wrap option is also good, because my thin legs don't work well with a wrap. The sleeve doesn't shift or slide. I love this thing! I love this brace, great fit.